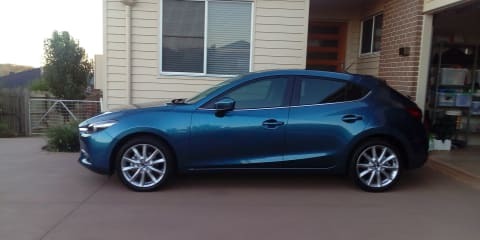 Some of you may have seen the last review I posted – the leaving of the Mitsubishi Outlander and the soon to arrive subject of this review, the Mazda 3 SP25. So we have moved from family car to fun car. In the search for this car, I started out thinking it’s the time in my life for a bit more of a spend and to get something nice. I tried the Merc’ A200, BMW 125i, Subaru WRX, Golf GTI and a few other expected contenders from the $45–$55K class. One of the dealers also happened to be a Mazda dealer and suggested I might like to try the Mazda 3 Astina. Seeing as he was offering, I thought ‘why not?’. Now, I am not going to write that ‘you won’t believe how it blew all the others away’, but it did surprise me what was included, how good it handled, and the reasonable power when pushed. And then the price, under $34,000 at the time of writing/purchase. Then I realised I could have all the power and handling in my preference of cloth seats (and a few less tech trinkets) for $25,990. What a bargain. So with the thought of only a few thousand to spend over the trade-in, I was sold. 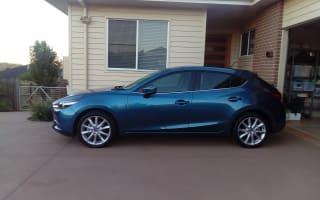 The popularity of the six-speed manual and 2.5-litre engine combination meant a four-week wait for my freshly made Mazda to be delivered. Now having driven it for four weeks, I am so glad I did not take the available auto. I am told the manual is the same one used in the MX-5, but even if this is not true, it definitely has a nice, precise sport-shift feel. Being naturally aspirated, the engine likes revs to perform, but it also sounds good getting them to me. Once you get into the 3000–4000rpm range there is very decent power. Remember that this is the Mazda 6 engine powering a much lighter car. And the other benefit is no need for the expense of 95 or 98 fuel. So even though you are not being promised the 5–6 litres per 100km economy of some of the others I tested (although that’s the sticker promise), at an average of 8L/100km (what I have seen at each fill) it’s fairly economical. The seats are very comfortable and hug you well for those fast cornering moments you will find yourself unable to resist in this car. I find myself making mental notes of any winding roads I find for that next Sunday afternoon solo blast. So, no car is perfect, but the Mazda 3 has my rating of very damn close. Most of its shortcomings are things that don’t affect your enjoyment of the drive/performance. I would like to see a USB port in the centre armrest where it is out of sight and mind. The only available points are in the cubby in front of the gearstick. My other bugbear is the space-saver tyre (although it could be the can of goo in the MX-5). There is room in the boot for a real wheel and tyre combo, and there would not have been much extra weight if it had been added. Overall, this car is a comfortable cruiser in city traffic and a fun machine when the right road presents itself (and I have spent $30,000 less than I first intended).